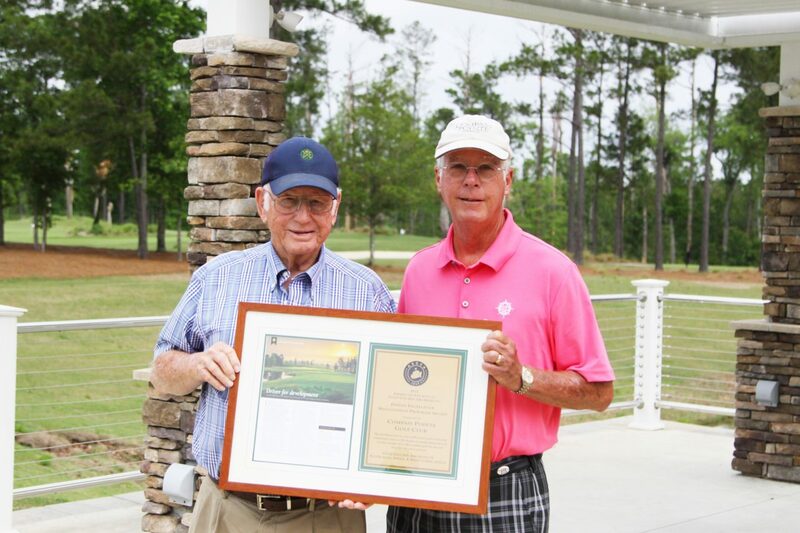 Leland, NC (May 15, 2018)- The Compass Pointe Golf Club which opened as a brand-new course in June 2016 has just received the official award for Excellence in Design from the American Society of Golf Course Architects. The course was designed by Rick Robbins with the assistance of Brian Lussier, who both said that Compass Pointe was one of the most enjoyable projects that they’ve ever worked on. This is the sixth year of the Design Excellence Recognition Program. Since its creation, it has highlighted the innovation and problem-solving skills required of today’s golf course designs, from new 18-hole layouts to practice facilities and renovations of various sizes. The first challenge Robbins faced at Compass Pointe was the constraints of the environmental requirements and financial limitations within a community that launched during the real estate market downturn of 2008. They had a 2,2000-acre community that not only needed a golf course as an amenity for residents to enjoy, but to also be an asset for real estate properties themselves. The solution involved many approaches, including: new golf routing to fit within existing wetlands; designing/maintaining the course to meet Audubon International standards; adding family tees so each hole may be played as a par 3; and using existing features of vegetation, wetlands, sandy soils to create a natural style course to reduce construction costs. The result was amazing, and they created a course that has become known for its fun and flexible playability. Members of the Society submitted nominations for courses all across the country. The 2017 nominations were reviewed by a panel of golf industry leaders, including representatives of the Club Managers Association of America, Golf Course Builders Association of America and Golf Course Superintendents Association of America; and winners were decided.